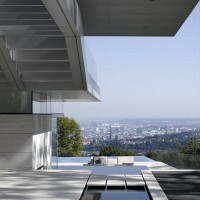 Najjar & Najjar Architects designed the Villa A, which overlooks the Austrian city of Linz. 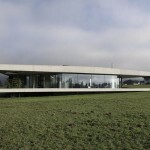 Villa A is located nearby on the slope of the Poestling Berg, a mountain overlooking Linz the capital of Upper Austria. 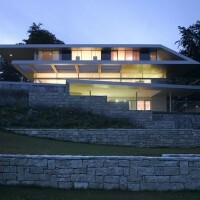 The site is accessed from the road behind leading down hills to the building’s main entrance, covered by an extended cantilever roof structure. 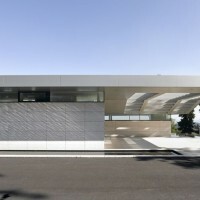 On the street side the building facade is closed with natural stonework to provide intimacy towards the street. The other side is entirely open to the panoramic view over the city. After crossing a small pond one is invited to take a breathtaking panorama view of the city before entering the central hall of the house. Following the topography of the site the house is partly caved in the ground. The dining area with an open kitchen is reached by taking a few steps down from the central hall. From there another couple of steps lead to a comfortable area where one can lounge on the sofa or chaise lounge overlooking the swimming pool and enjoying the marvellous view over the city. The floor materials are distinguished according to level and function. The architect’s intention was to embrace various functions in one open living area, accommodating the various functions on different levels, always balancing their functional particularities within an open space. 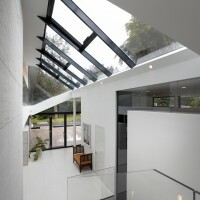 Moreover the large scale glazing and the sliding elements blurs the indoor area and outdoor space. 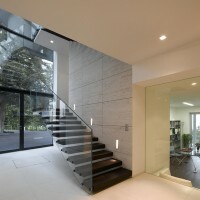 The bedrooms are located on the upper levels that are accessed by stairs which lead to an open gallery. The basement floor is partly carved in the ground allocates fitness and wellness facilities, office and a playroom for children. The parking garage and the machine room are dug in under the access road on the north side of the building. 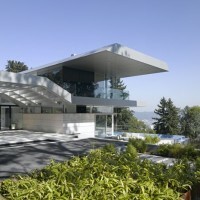 The Roof is a steel beam grid structure with aluminium panel cladding. On the southern and western side of the building the roof cantilevers beyond the terraces so as to provide an efficient sun protection in summer. The low winter sun warms up the interior space. This implementation of the passive energy concept is supported by a recuperator in the ground and sun collectors on the roof. 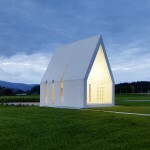 It is highly energy efficient and fulfils all requirements for a “green building”, as set in the European building standards. 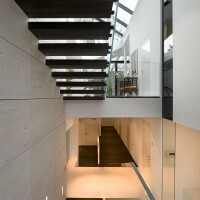 Visit the Najjar & Najjar Architects website – here.